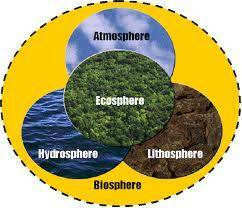 The three components and the organisms inhabit are known as the biosphere. It is also called as ecosphere. The biosphere is a core concept within Biology and Ecology. • The term "biosphere" was coined by geologist Eduard Suess in 1875, which he defined as "The place on Earth's surface where life dwells." • The biosphere has evolved 3.5 billion years ago when the first single-celled organisms originated. The organisms on this Earth are interacting with each other and carrying their life processes like respiration, reproduction, etc.. The biosphere is the outer layer of the Earth and also very thin in size. Can you name the abiotic components or non-living component of the environment? Land, water, and air constitute is known as the abiotic components of the biosphere. The living organisms of the Earth, like plants, animals and microorganisms, constitute the biotic or living component. There is a constant relationship between biotic and abiotic components of biosphere. They both interact and benefit each other. Systems like transfer of food, transfer of energy and others typify this interaction and exchange. It is knows as a steady-state system. They both balance with the processes. So it is clearly known to us that biosphere is the largest and most nearly self-sufficient biological system. • The distance between the Earth and the Sun. If the planet was closer to sun, it would be very hot, and if it was far away from sun, then it would be colder. Even the tilt of the Earth has its influence. Earth's tilt directs the climate changes and seasons by balancing the Earth’s distance from sun. 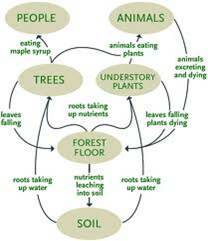 These factors change the land and environment and the organisms must adapt to it. We can withstand for any changes Bbut are still vulnerable to tsunamis, volcanoes and earthquakes. Many units are present in biosphere. It is the mix of all large and small units. Forests, deserts, and other features belong to larger units and lakes, grasslands, etc., belongs to smaller units. All these units form ecosystems. Thus, an ecosystem is a functional unit of biosphere, comprising all organisms and non-living environment in a given area of the Earth, which result due to interactions between organisms and the environment. • Simply we can say the biosphere is the biological component of Earth systems and it is all about life. Want to know more details about Biosphere? Click here to schedule a live help with an eTutor!